Bingo Card Creator lets you print custom bingo cards on your own PC! Create custom printable bingo cards for instructional and entertainment purpose with Bingo Card Creator. This creative and educative tool is available for PC and Mac OS X platforms. No need to pay $10 for every set of bingo cards any more. Set aside the traditional publishers and start creating custom printable bingo cards on your own PC. In-built are a list for math facts, Dolch sight words, and much more which can be used or alternatively you can make your own set too. This money saving tool allows the user to print multiple cards on a single sheet. 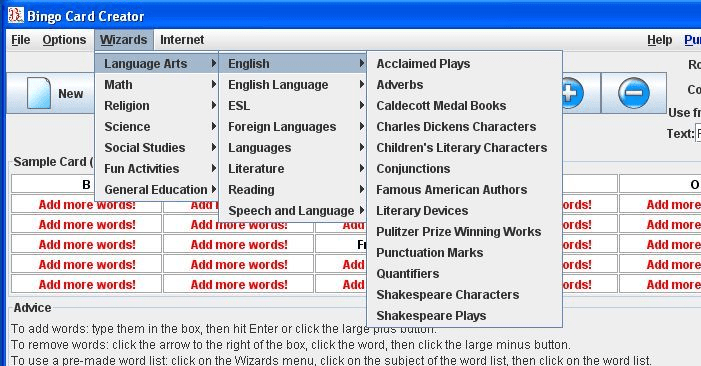 With unbound flexibility one can simply type in vocabulary list, numbers, letters, maths facts, social studies facts, names and much more. Get the free trial version which can conveniently up-graded. This upgraded version is supported with free upgrades and support for life, as well as a 30-day money-back guarantee. This interesting way of learning for all age groups will teach, access and motivate children and adults too. Bingo Card Creator lets you print custom bingo cards on your own PC! Stop paying $10 a set for bingo cards from traditional publishers of educational printables. You can choose from included lists (math facts, Dolch sight words, US states, holiday activities, and over 250 other activities!) or tailor make your own set. Bingo Card Creator can print multiple cards per page to save paper. Teachers are currently using Bingo Card Creator to teach first grade, second grade, third grade, fourth grade, fifth grade, middle school, and adult language learners and ESL students. It works for reading lessons, geography lessons, Dolch sight word lists, educational math games, and much more. Bingo Card Creator will save you an hour of preparation every time you play bingo. You will never have to buy a $10 set of cards just to teach your students again. You can have your bingo games finally match up to the activities you are doing in class, instead of feeling constrained by the need to fit your class to the manipulatives you have on hand. Best of all, Bingo Card Creator is available as a free trial. You can use it for as long as you want -- we want you to have adequate time to find out just how much time and money it will save you. The upgraded version comes with free upgrades and support for life, as well as a 30-day money-back guarantee -- if you're not totally satisfied with your purchase we don't deserve your money.